Do you have an old wooden deck or dock that has started to chip, splinter or fall apart? Are you tired of burning the bottom of your feet because your deck is so hot? Then you need to look into PVC decking. 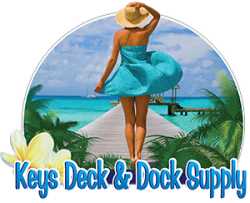 PVC decking in Pompano Beach is a great choice for your next deck or dock. No one likes going outside and burning the bottom of their feet on the deck or dock because of the heat. In South Florida, the heat and humidity can be brutal during the summer, so having a plastic PVC deck is very practical. Not only are PVC decks naturally cool, but worry no more about splinters from your wood deck. PVC decks are made from 100 percent PVC plastic, making it splinter proof and naturally cool. UV and Fade Resistant. When choosing your new PVC deck, you can choose from a wide variety of colors, texture and design options. The nice thing about PVC decking is its color will not fade from the sun. Carefree Maintenance. Plastic material is by far the best material when it comes to decking. Not only is it incredibly durable, but you don’t need to worry about maintaining your new deck or dock if you choose to go with PVC decking. Slip Resistant. If you have kids, this could be the number one reason you’ll want to get PVC decking. PVC decking is slip resistant, so there is no need to worry about your children getting hurt on your deck. When wood docks and decks get wet, they can become very slippery, but worry no more with a new PVC deck. Mold and Mildew Resistant. Another major benefit of having a plastic, PVC deck or dock is that they are resistant to mold and mildew. This is a big concern, especially for wood docks. Have no worry anymore with our mold and mildew resistant PVC docks.